Home Iftikhar Islam Valentine's day Youth Valentine’s Week – O youth where are you marching towards? 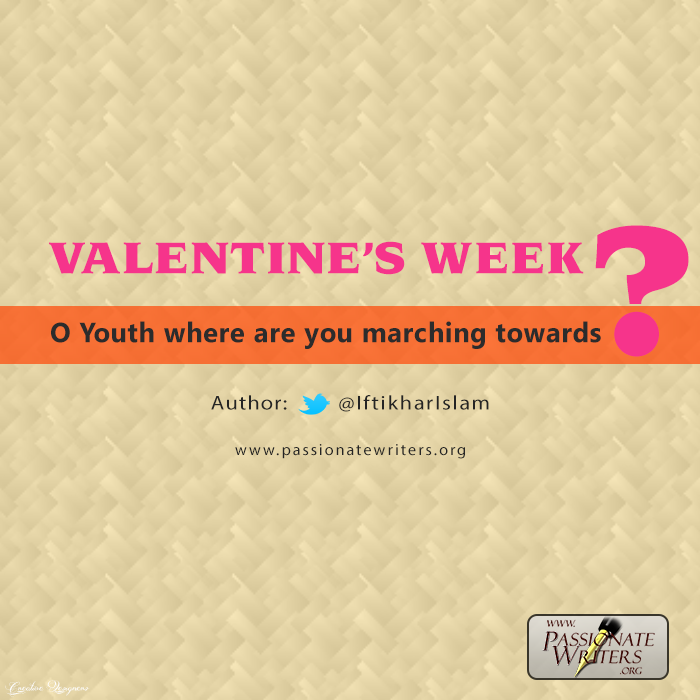 Valentine’s Week – O youth where are you marching towards? You might have stepped into your teens and passed much of your time as teen age. You might have gone to the school and have also seen some of the college life. So you might have distracted from the real purpose of life. You are not born to get lost in this false glamor of the world. You are here to lead; to establish peace and justice on earth on behalf of Allah. If you celebrate Valentine’s week or be a part of it – in one or the other way – then I would like to remind you the prophetic sayings wherein he said, "The feet of the son of Adam shall not move from before his Lord on the Day of Judgement, until he is asked about five things: about his life and what he did with it, about his youth and what he wore it out in, about his wealth and how he earned it and spent it upon, and what he did with what he knew" (Classified as Hasan by Albani in Saheeh At Tirmidhi 1969). Until you answer about your youth, your feet shall not move from your Lord. Fear Allah and stay away from the evils that has penetrated in our campuses. Get better education, focus on your dream and strive to earn your livelihood in halaal way, for it Allah who is the best of the providers, so do not cross the limits set by Allah. This is the age you feel like restricted, you sense that we try to cut your wings so that you cannot fly. Remember, my dear brothers and sisters, it is the age we have already passed out. We have seen this life much closer than you. We do not try to cut your wings, rather we regulate you. We guide you in a proper manner so that you can fly higher and higher and get successful and achieve your dreams beyond this life. I remind you of Muhammad Bin Qasim, who was only 16 when he became the Army General and died at the age of 20 in the year 715 CE. We need to revive the Way of Prophet Muhammad ﷺ and be a role model for the generations to come. Remember, this life you have is a possession of Allah and we have to answer about it. Do not fall into the traps of this so called glamorous world and ruin your youth. Allah loves you and wants you to be successful in this world and in the hereafter. Work hard and stay away from sins – no matter how small it is.